No doubt about it - Agustín makes a really tasty meal. 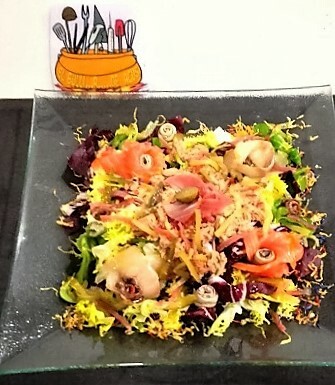 (* Save the fresh anchovies and half of the salmon to make "flowers" to decorate the dish). Put all the sliced fish into a dish or glass bowl. Chop the capers, mix them with finely chopped onion and add the mixture to the fish. Add the juice of two lemons and the finely chopped dill. Mix everything well to blend all the ingredients evenly and let it rest while we prepare the salad bed. In the serving dish, arrange the mixed green and red salad. Season and dress the bowl of fish with olive oil. Mix well and spread over the salad. 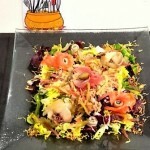 Make some "flowers" with the reserved unsliced salmon and fresh anchovies, and arrange them on the salad.